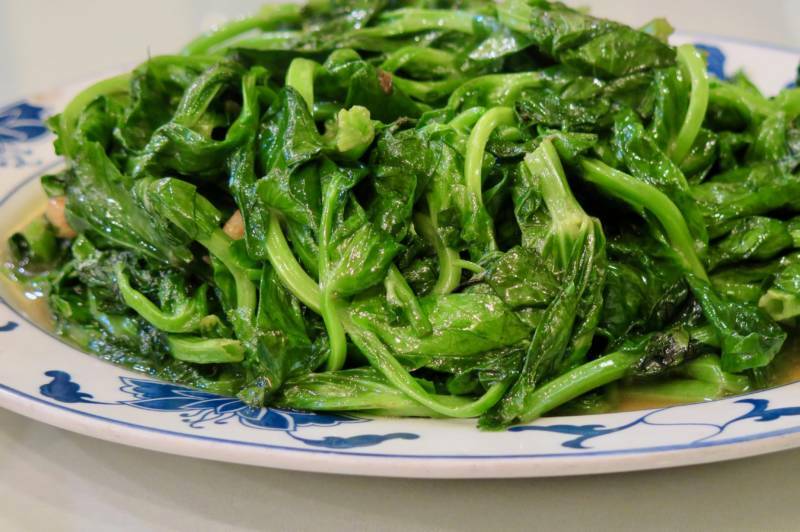 Visit this Inner Richmond Chinese restaurant for classic Shanghainese and Taiwanese dishes, plus there’s a new Le Marais Bakery and commissary in Polk Gulch, and let’s look at three new restaurants opening in the North Bay. Over on Geary in the Inner Richmond is an old-school Chinese restaurant with a bright orange tiled exterior, Five Happiness, that cars have been whizzing by since 1975, but the smart ones pull over. Fortunately, about 10 years ago, local food writer Patty Unterman tipped me off to this restaurant, a favorite of Cecilia Chiang, our local Chinese culinary matriarch, who is still amazingly with us and going out to eat all the time at 99 (she’s a powerhouse of energy). Many know this restaurant for different things: a bunch love to come on the weekend for the Taiwanese breakfast, while others come for banquet dinners with Shanghainese specialties, and neighborhood folks swing by for the lunchtime rice plate specials (which tend to be more Americanized greatest hits but are well-executed). The menu definitely bounces around with some different regional dishes and styles: it ends up they have a Cantonese chef from Hong Kong, a Shanghainese chef, and a Taiwanese chef! I used to host an annual Chinese birthday banquet dinner with my friends, lining up a new menu and restaurant each year, and the meal we had here was fantastic, sealing its reputation as a favorite Chinese restaurant of mine. We requested the “Cecilia Chiang” banquet, just as Patty Unterman instructed me to — the very kind longtime manager Bill Yang (his mother is the owner) faithfully duplicated it for my group, with a platter of cold appetizers, chicken with fluffy egg white, red pork shank, eel and chives, and many other special dishes. At a recent meal, my friends and I dropped in on a whim, with no advance planning. The best thing to do is let Bill lead you through the menu, once he figures out your taste (and appetite). 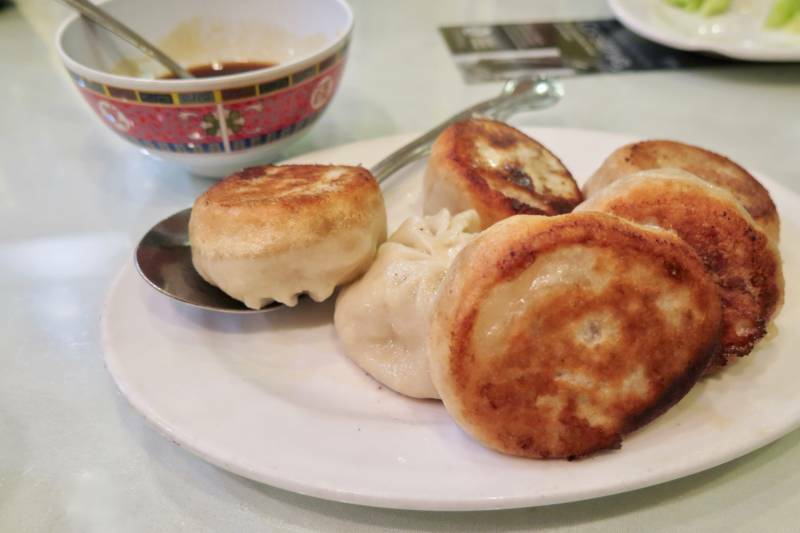 I always love their green onion pancake ($6.50), it’s a flaky yet sturdy one, and not too oily, and it’s hard to resist Shanghai pan-fried pork buns (sheng jian bao) for just $6.50. There's so much juice inside these, I prefer them to the xiao long bao they serve here. Some real gems are on the front of the menu (in the “Family Tradition Private Kitchen” section) — the steamed fish fillet and egg white with tofu ($13.50) is such an elegant and chic dish, so silky and delicate, topped with threads of ginger. But our table found the jumbo prawns in Szechuan red garlic sauce to be overcooked, so the $19.95 price tag felt steep for six prawns — we should have followed Bill’s advice and ordered the ribs instead. He’ll also steer you to the freshest vegetables — the pea shoots we had were so green and vibrant and with the smoky kiss of the wok. He also offered us some perfectly seasoned marinated cucumbers in the beginning, and we finished our meal with almond tofu, such delicately fragrant little cloud-like bites. 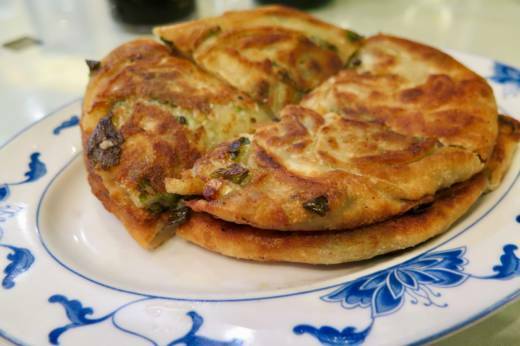 Hopefully, you can order the Peking duck ($49.95) 24 hours in advance and then come here with a group — you’ll find one of the better birds in the city, artfully presented with tortilla-like, northern-style handmade pancakes instead of buns. If you’re coming in last-minute, the tea-smoked duck ($18.95 for half) may be tempting, but I found it too salty. 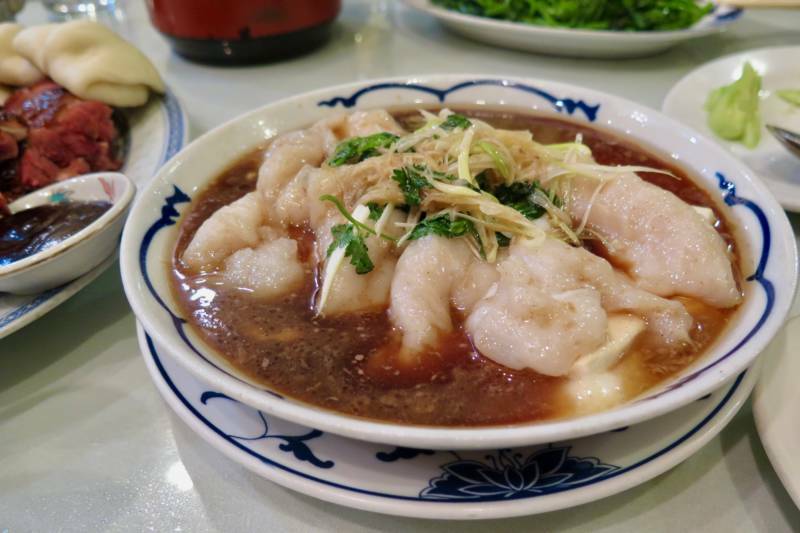 On the weekend, you’ll want to come in before noon for Taiwanese breakfast, like hot soy milk (savory or sweet) and Chinese doughnuts that are the shape of crullers or churros (youtiao), spicy beef noodle soup, Taiwanese ground pork and rice (lu rou fan), and more of those green onion pancakes! The Shanxi hand cut-noodles are also special here. The restaurant had a renovation about five years ago, taking the Pepto pink tablecloths away with it (which I secretly loved) — it’s a good looking room, with butter yellow walls and classic rosewood high-backed chairs, and, of course, many round tables. If you can, at least get a group of four friends together to dine, but the more the merrier. You will have an absolute feast for about $25 per person, and you can thank me later. Hours are 7am–2:30pm, extending to 7am–7pm in mid-November. 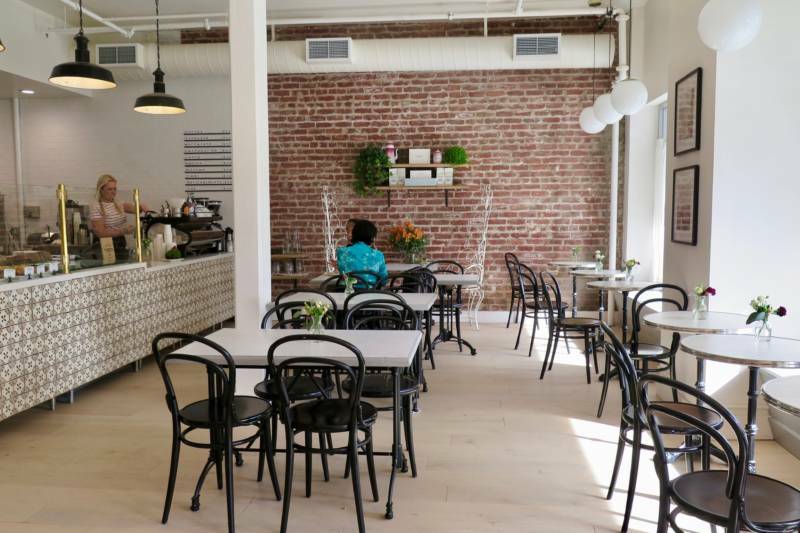 Now open in the TenderNob/Polk Gulch is the latest café from Le Marais Bakery, but this is also owner Patrick Ascaso and Joanna Pulcini Ascaso’s new 3,000-square-foot commissary and lab (with a 2,000-square-foot basement!). The front of the café has plenty of tables by the sunny windows, with fresh flowers on each table, and there are a few booths flanking the left wall. You’ll note the vintage light fixtures, pretty photography, and a fun mural by Sabina Addis. There’s also a big open kitchen, so you can watch the staff in action. 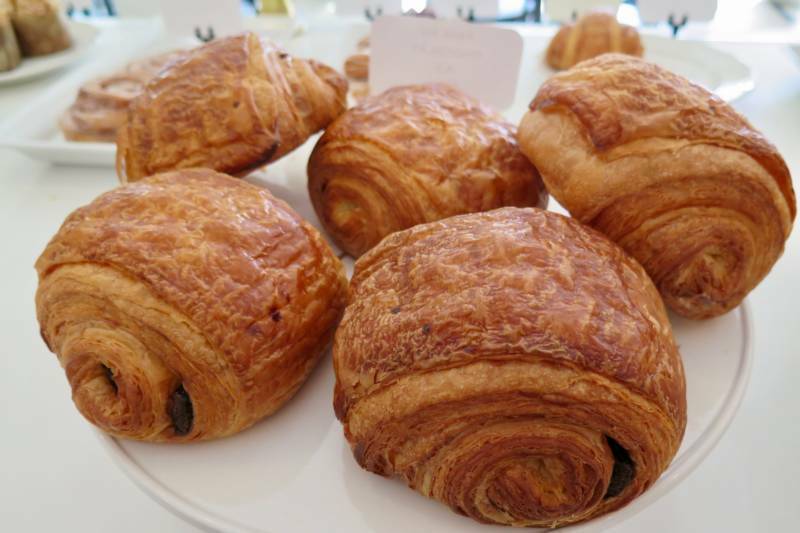 The tiled counter is full of baked goods from head pastry chef Hikari Hori, formerly of Fournée Bakery, lined with viennoiserie-like croissants, pain au chocolat, kouign-amann, and seasonal fruit danishes, plus some savory croissants for lunch, like ham or herbed turkey. There are savory scones, financiers, and all kinds of cookies, and a delightful morning bun to go with your coffee — they have their own custom roast from Verve Coffee Roasters and a beautiful Strada espresso machine. Look for some new and inventive pastries coming soon, like lemon cream–laminated brioche, a truffle croissant, and croissant cones and ice creams. You’ll find their popular brunch boards, avocado toast, and croques soon, once they get things fully ramped up (for now, you can enjoy quiches and yogurt bowls). 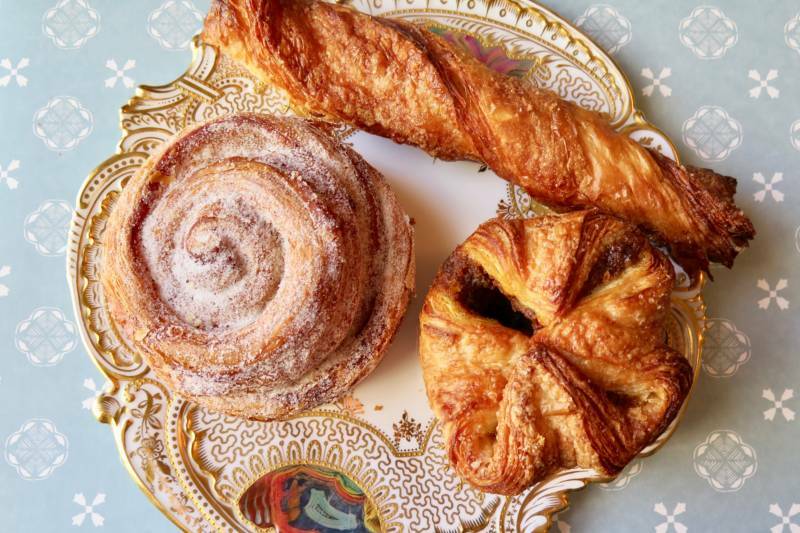 Just in case your friends in Omaha or Miami are jealous, you can take advantage of Le Marais’s partnership with Williams Sonoma and ship their croissants nationwide, as well as a pastry sampler, an upcoming peppermint-chocolate croissant that tastes like peppermint bark for the holidays, cinnamon buns, apple swirl danishes, and pumpkin kouign-amanns. There’s a new restaurant opening in the Maxwell Village center in Sonoma on November 7 called Mint and Liberty from owners James and Mila Chanamé-Hahn (part of the Sunflower Caffe family). They're offering a modern twist on a classic diner with a wonderfully talented chef at the helm, Michal Siegel (formerly Shorty Goldstein’s and Betelnut in San Francisco). 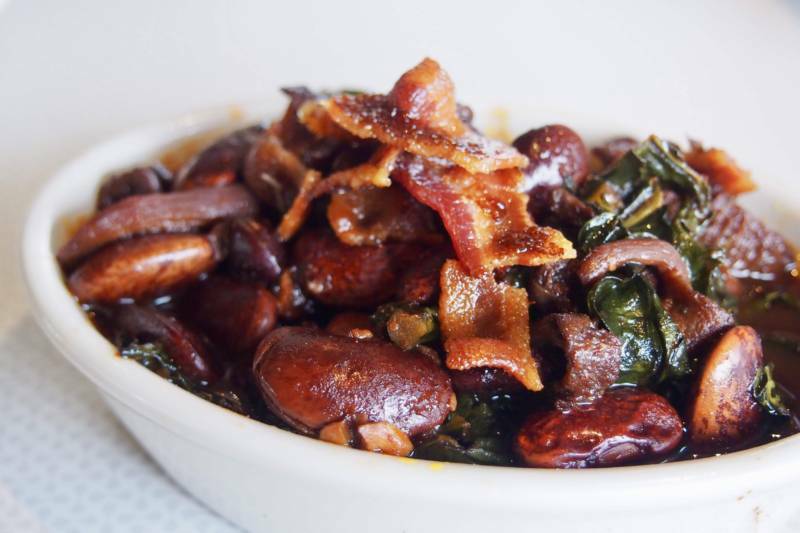 His menu features regional American dishes, from northern ones like loaded baked potato pierogi to braised Rancho Gordo scarlet runner beans with smoked mushrooms and kale (you can get them with or without bacon), while southern dishes include shrimp gumbo and BBQ baby back pork ribs. Fans of Siegel’s pastrami will be happy to see his Rachel sandwich representing the east, and there’s a Green Goddess Cobb salad repping the west that looks fantastic. 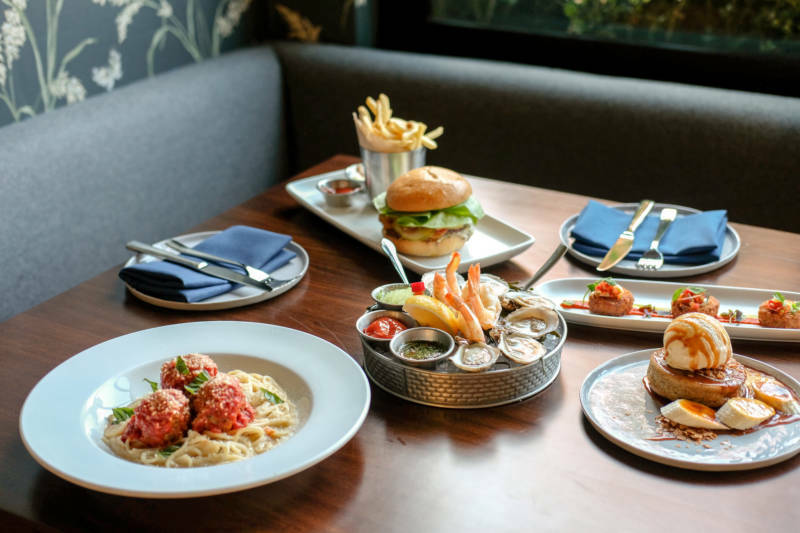 There are a variety of burgers, breakfast served all day, and some larger family-style dinners served after 5pm, like cioppino or a whole-roasted chicken. Fresh and local produce from LOLA Sonoma Farms, Bee-Well Farms, and Sweetwater Farms are highlights. There are sweets from Honey and the Moon, plus milkshakes, wine, beer, and cocktails too. Fans of Scott Beattie’s sublime cocktails from his time at Cyrus, Spoonbar, and Goose and Gander (among other places!) will be happy to know he’s behind the list at Bollywood Bar & Clay Oven in downtown Santa Rosa. He’s working with bar manager Andrea Mota, previously Geyserville Gun Club Bar and Lounge, who will be behind the bar nightly. The newly open restaurant is from Chandi Hospitality Group, who brought on James Beard Award finalist chef Niven Patel, who has created a modern Indian menu that is ingredient-focused with seasonal produce from quality purveyors (he’s an avid farmer, with Gujarati roots, which is where he sources the majority of his spices). 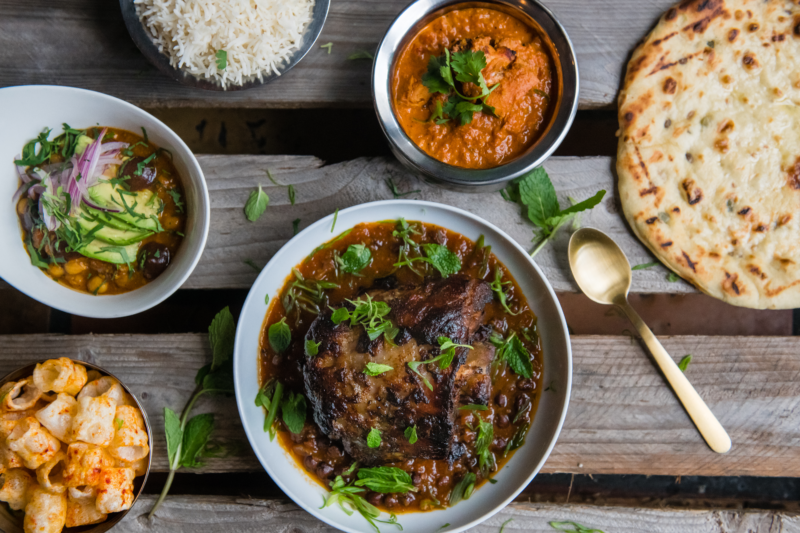 You’ll find local vegetables in his pakoras, and his turmeric-marinated rockfish is served in a coconut curry with curry leaf, carrot, zucchini, and fennel and cooked in their hearth oven. A short rib uttapam also sounds fantastic. He was previously at Ghee in Miami, where he met Will Fernandez and Alex Sarria, the chefs de cuisine at Bollywood. The backlit bar has a modern and eye-catching style, and the restaurant offers a variety of seating options, whether you’re a couple or dining with a big group. In downtown Kentfield in Marin County, chef Jared Rogers (previously Picco in Larkspur) and Bay Area bartender Dustin Sullivan have opened their new bar and restaurant, Guesthouse. Look for an ingredient-driven, seasonal, West Coast–inspired American menu, including Dungeness crab cakes; Wolfe Ranch quail off their J&R wood grill (with chanterelle and bacon stuffing, grits, roasted carrots, and game jus); and a Kurobuta pork chop with crispy potatoes, spiced apple, and arugula. The side of cauliflower gratin with mornay, breadcrumbs and caramelized onions is sure to be a hit. The cocktail menu features classics like a Negroni with a twist: it’s a dry mezcal Negroni, with mezcal, Cappelletti, dry vermouth, bitters, and grapefruit zest. There's also a comprehensive wine and beer list, with a focus on organic and biodynamic wines. Hannah Collins Design helped remodel the space, which features 110 seats, an open kitchen, textured and wallpapered walls, wainscoting, and a 16-seat concrete bar.